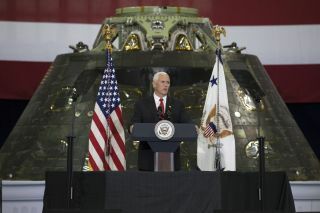 During a visit to NASA's Kennedy Space Center on July 6, 2017, Vice President Mike Pence gave a speech in which he called for crewed missions to the moon and Mars. The newly re-established National Space Council will hold its second meeting today (Feb. 21) at Kennedy Space Center in Florida, and you can watch it live online. Led by Vice President Mike Pence, chairman of the council, the meeting will begin at 10 a.m. EST (1500 GMT). You can watch it live here on Space.com, courtesy of NASA TV, or directly through the NASA TV website. The discussion "will include testimonials from leaders in the civil, commercial, and national security sectors about the importance of the United States' space enterprise," NASA officials said in a statement. At the council's first meeting on Oct. 5, Pence spoke of sending astronauts to the moon and striving to maintain "a constant commercial human presence in low-Earth orbit." Two months later, President Trump formally directed NASA to send humans to the moon when he signed his Space Policy Directive 1. Considering the theme of the meeting and Trump's new directive, the council's discussion may include NASA's return to the moon and the role commercial-spaceflight companies will play in that endeavor. This will be the second formal gathering of the National Space Council since President Trump reinstated the council through an executive order he signed in 2017, nearly 25 years since the last National Space Council met under the administration of (former) President George H.W. Bush. The National Space Council meeting is not the only space event today. The private spaceflight company SpaceX is scheduled to launch a Falcon 9 rocket carrying the Spanish radar-imaging satellite Paz and two prototype broadband satellites for SpaceX's own Starlink constellation. That mission will launch at 9:16 a.m. EST (1416 GMT) from SpaceX's pad at the Vandenberg Air Force Base in California. You can watch it live here, or directly at SpaceX's website here , beginning about 20 minutes before liftoff.